The title Nirvana was selected for this piece because I wanted to suggest the joy or "bliss" which most needle addicts get from their stitching. This band sampler was stitched for the cover of my book, Potpourri of Pattern, as a design that combines several interesting open canvas networks into an attractive arrangement. All of the patterns used are original stitch treatments developed from my own doodles. Part of the class discussion will focus on methods to develop such patterns along with guidelines for developing sequences for such patterns that will conceal the traveling paths, allowing open areas to remain uncluttered. The main outline of the sampler is a Flip-flop Diagonal Hungarian stitch that produces a charming rick-rack edge. Students will have the option of executing all of this outline prior to class or merely basting the dimensions on quickly so that the inner fillings can be placed accurately in class. If students wish to personalize their pieces, they can add an extra pair of panels around the middle area, and this possibility will be discussed in the cover letter of the mail-ahead segment. Students may provide their own kits for this class to allow them to work in their preferred colors. 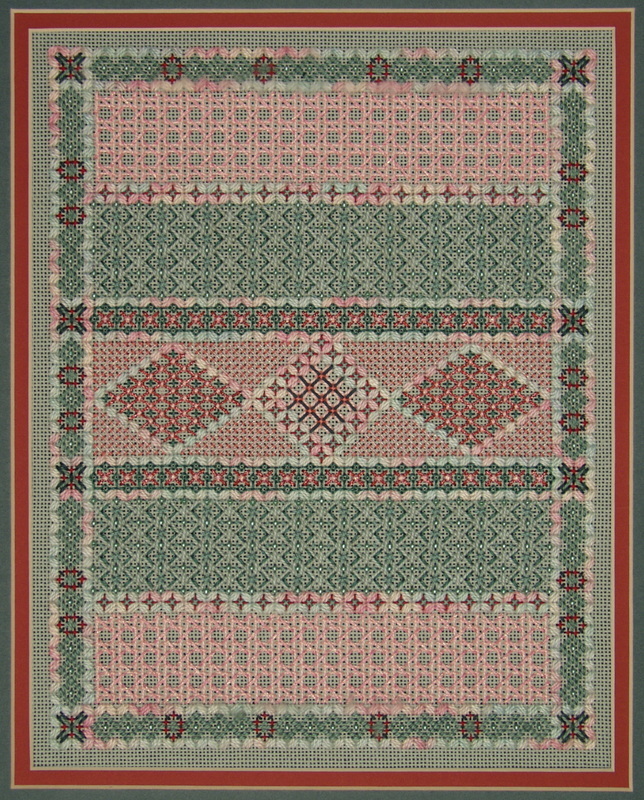 The teacher will offer a kit in the colors of the original model (greens and pinks on a sage ground with the Springtime Watercolours) Threads recommended for this design include Watercolours for the outline, pearl cotton in two weights and Kreinik metallics in two weights, but other threads that fit 18-mesh may be substituted, if preferred. Guidelines regarding value ranges will be specified in the individual mail-ahead packet which will be sent to each student with the instructions needed for the prework. Techniques explored in this design are blackwork, couching, beading, and darning along with the open canvas networks since most of the fillings are composite combinations. Students will discover that the negative space created by these open stitches is as interesting as the stitch textures themselves, particularly on a colored ground. COLOR CHOICE: None for kit but students may choose to provide their own canvas and threads. PREWORK: The framework of the design must be outlined. Estimated time: 6-8 hours. 1. To explore composite patterns, particularly open styles where the negative space between stitches is an integral part of the pattern. 2. To learn methods to create such patterns and to chart proper sequences that conceal the traveling threads. 3. To learn some beading, blackwork and couching techniques. TEACHER PROVIDES: Either a complete or partial kit with the instructions and a color copy of the model. STUDENT PROVIDES: A 14" X 16" stretcher frame (or a longer one can be used for those who wish to add some lettering or additional embellishments) and a clamp or weight to secure the frame to a table.